For aesthetic reasons or, perhaps, just to be contrary, we have organised autographs of Prime Ministers in order of their dates of first holding office. The political office of Prime Minister in the United Kingdom is one that has evolved over a period of time and the term Prime Minister, although in Parliamentary use in the 19th century was not given official recognition in the Order of Precedence until 1905. The office of Prime Minister is generally synonymous with that of the First Lord of the Treasury. It is generally accepted that the list of British Prime Ministers begins with Sir Robert Walpole who led the Governent from 1721 to 1742. Up to and including the General Election of 2010, there have been 74 Prime Ministers of the United Kingdom. These include some of the greatest political figures on the world stage, such as Winston Churchill, William Pitt, Benjamin Disraeli and William Gladstone but also some lesser known and even obscure figures who made little mark on the pages of history. Some Prime Ministers, such as the Duke of Wellington, had successful careers in other fields and the Duke's autograph is also in demand by collectors of military autographs. 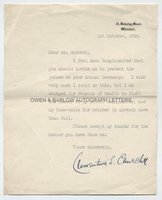 Owen & Barlow's autographs in this category include the wives and family of Prime Ministers.